HL Washrooms supply the Healey & Lord Zero 100 range of HBN00-10 compliant back-to-wall Doc M packs suitable for infection control zones and areas of high traffic where hygiene and reducing the risk of cross contamination is paramount. 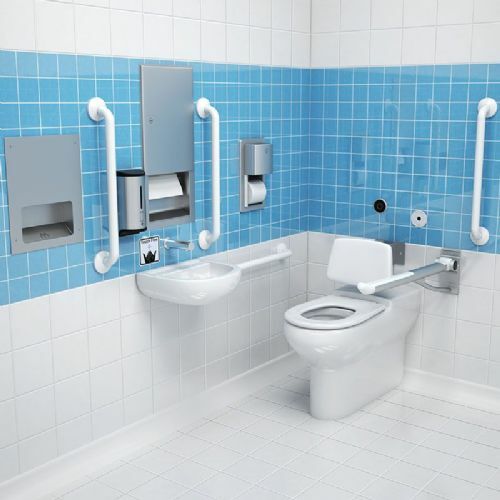 The DDA WC's are rimless flush and can be fitted with push button or no-touch sensor controls, TMV3 sequential or infrared no-touch taps. In addition, a fully automatic pack can also purchased which includes an additional auto sensor, so if the user is unable to, or does not flush the WC, it will automatically do so upon their departure from the cubical.